After a lot of reading about other people experiences on this subject and taking it all to account, I've decided to put together this small tutorial about making homemade squirrel shocker. The tutorial is aimed to get you acquainted with all the practical advice I've found out there, along with possible dos and don'ts during the construction. Following lines should help you avoid making common mistakes and help you avoid the dangers along the way. But more about that later on. 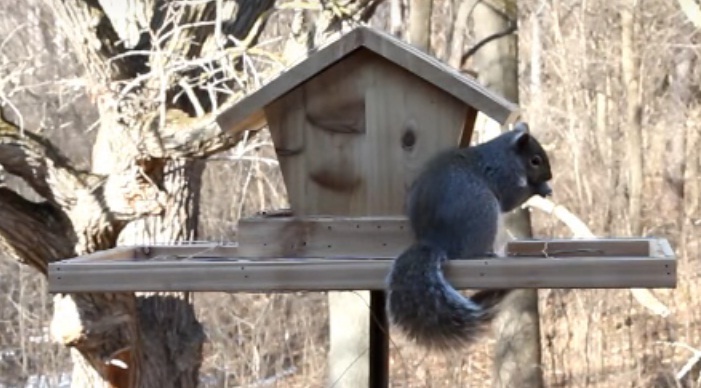 Of course, I'm not here to talk you in or out from making your own electric anti squirrel bird feeder. I'm here only to point out some important things you should take into consideration before you decide whether to go for homemade squirrel shocker or not. How easy or how hard it is to build homemade squirrel shocker? That's tough question for me to answer, because the answer is truly on your side. Squirrel shocker construction is really no brainer for those that are good with hands and already have some basic knowledge of the electric current. But for the folks that are less skilful it will require some more effort and possibly more time. If you feel you're in this group, I still encourage you to read this tutorial to the end. Who knows, maybe you are just being harsh on yourself? Certainly, the power is in the knowledge. So just to be sure you are familiar with the way squirrel shockers work, I strongly recommend reading my article about squirrel shockers basics first. There you will find plenty of theoretical knowledge that is necessary for your personal squirrel shocker project. Why should you go for DIY squirrel shocker instead of buying one? Homemade squirrel shockers are both fun and challenging (in a good way) to build. Buying branded squirrel shocker is not even closely adventurous in that way. You can use your imagination to customize your DIY shocker any way you want in terms of dimensions, looks, wooden materials you'll use, seed capacity, etc. Commercial shockers are "as is" and that's it. Improper placement, wiring or wrong choice of electric supply for DIY squirrel shocker may result in hurting both squirrels and the birds. That is the danger I've mentioned in the introduction. BTW, with commercial shockers you don't risk hurting the animals. The key component in the electric circuit of DIY shocker is proper electric power energizer. If you don't already own the right type of energizer, you'll need to buy one. It means that homemade squirrel shockers (if made from scratch) are not much cheaper than commercially made shockers as one would expect. As you can see, DIY squirrel shocker construction is more like subject to fun, creativity and learning process than a chance to save some bucks. In fact, at the end of the day, a really good homemade shocker may cost you as much as the best squirrel shocking bird feeder you can buy. If you are not much into carpentry, the first option may be the easier way. But why carpentry? Because all three components: bird feeder, the threshold and the frame should be made of wood. Metal, glass or plastic materials are difficult for wiring because you can't fasten the wire to it by hammering. I addition, metal alone may come pretty messy in terms of conducting electric current because metals are conductors while wood is not. In case you don't already own wooden bird feeder house and you can't construct it yourself, try your local shop or pick one at the Amazon.com. The construction must be robust so it can stand hammering nails to it when fastening the wires. Just look how thick and sturdy the wood is on the above image. Try and find feeder with threshold. If you take a good look at the image above, you'll notice wooden threshold around the bird house is wired. Threshold is mandatory for wiring and if your feeder does not have it, na old wooden serving tray or something similar should do the trick. It is also good protection from spilling the seeds from the feeder. Aside from the bird feeder with threshold, you'll need the frame (check the photo). It's outer wooden structure around the feeder that looks like clothes drying rack. The frame is also wired with parallel grid of wires. For the purpose of the frame you can use some old picture frame. The larger - the better. OK, now we are getting to the most important part so please pay close attention. 1. Electric energizer - this is your electric power source. It is usually used for electric fences to keep away domestic and garden animals away from passing the fence line. Energizers of this kind feature pulsating electric current - a single, short electric impulse at the time. Thus, shocked animal has enough time to recover and instinctively move away from the power source. 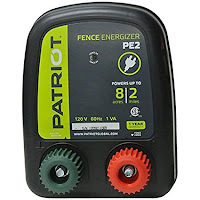 Energizers are plugged in 110V wall outlets and when connected to the fence (in this case: the feeder wire circuit) they send electric energy impulses to the circuit. Since the squirrels are small animals and we do not want to harm them, I strongly recommend energizers with small energy outputs of 0.1 to 0.2 Joules (J). For the squirrel shockers the most used energizers with very positive reviews are Patriot PE2 for smaller shocks and Dare DE 80 for slightly stronger shocks. Energizers come with detailed manual instructions that will give you plenty information on how to wire them and much more details for broader picture of usage and maintenance. 2. The second component is your electric grid. It is made of two separate circuits: power circuit and ground circuit. On the image above you'll notice two clamps: red and green. 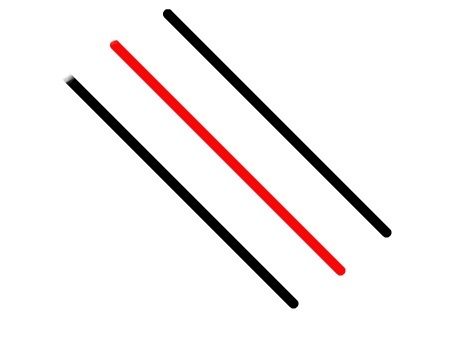 Power circuit starts from red clamp, while the ground circuit starts from green clamp and ends in the ground with ground rod. Once again, these two circuits are separate and the electric current does not run until the squirrel touches both circuit wires at the same time. So, when it happens, the electricity starts running through squirrel's body and the squirrel will experience the electric shock. The logic behind the wiring is simple: you need to place power and ground wires next to each other in parallel grid using the rule: power, ground, power, ground, always shifting alternately... and never like power, power, ground, ground. Different circuits must be neighboring ones. For example: if the roof is power, the threshold must be the ground and then the first neighboring frame wire must be power, the next to it is ground... and so on. I hope you understand that the squirrel must touch both ground and power wire at the same time. If it touches only one wire, nothing will happen. Another important thing is the distance between neighboring wires. Neighboring wires should be close enough so that the squirrels can touch them synchronously, yet far enough so that the birds can't. Of course, that depends on the size of the birds you are feeding. As the wires are concerned - it's best to use galvanized aluminium wires of small gauge (up to 12) because of low impedance and durability. I used 1-1/4" PVC for the bird feeder pole, and wrapped (candy cane style) two runs of #12 copper wire spaced 2" apart (one hot, one ground). Then connected the bottom ends to the electric fence charger. Should both circuit wires that are mounted on the feeder be bare wires with no insulation? What about the circuit wires that run from the PE-2 energizer up to the feeder, but not into it?